There is no desktop app for Any.do. This is the only con I can see now. ClickUp is great for basically every business. I think if you need recurring tasks, ClickUp is a clear winner as I don't think that is offered with Basecamp. Also, their free version is great! We just use the free version, even though the paid version is cheap, because it has everything you need.I think the important thing is to make sure you use it for everything in your business. As with any tool like this, if you integrate it into every part of your business and use it 100%, it will be great, if you only use it occasionally, it's basically useless. GUI-- The user interface is very thoughtful and pleasing to the eye. Reporting-- Allows me to generate reports on the status of all projects for the management team, to show the progress on any given project. 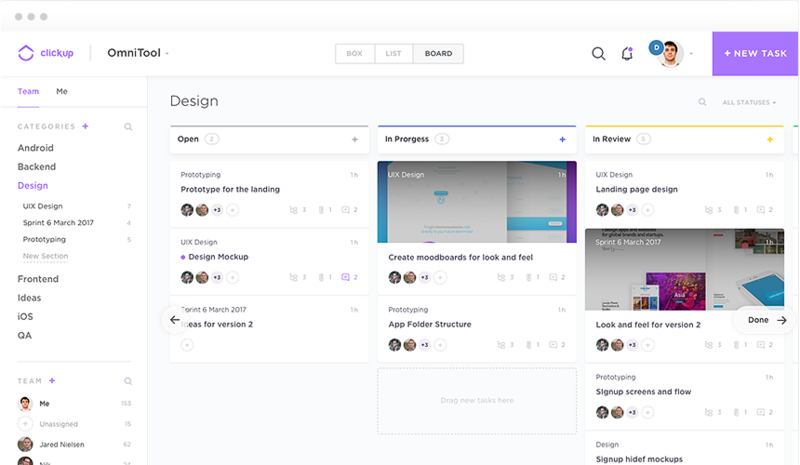 There are multiple ways that you can see your task: timeline, dashboard, and list. Whatever suits your fancy. It is not completely free. Basic use is limited in what you can do. There is a per-user pricing model, which makes it more difficult to justify with larger teams. ClickUp will often send unnecessary emails. I do not like too many email notifications and hope that can be consolidated in the future. We are pleased with using ClickUp and it's cost effectiveness. We are very likely to stick with ClickUp. Any.do is simple and easy to use. I'm huge fan of Wunderlist, but now a fan of Any.do too. There is almost no comparison. With Trello, you basically only get the board view and it doesn't do recurring tasks. To me, it was basically useless. If you can't run your whole business using it, it's not useful.Teamwork Projects is more similar to ClickUp. However, Teamwork is SLOW! (hopefully they've sped it up recently) Also, Teamwork's organization and hierarchy is very strange. It's like they didn't start with the end in mind but instead just started extra features as they went. Teamwork is like $60/user compared to ClickUp, which is free for basically the same features (ok you can pay like $5/month for additional features and reports). The only substantial benefit to Teamwork is that Teamwork has a Gantt chart. Clickup has helped the team with improving overall productivity. We have improved our task tracking and closure process. It's convenient to pull out reports and assess team's efforts over a period of time.